Everyone is listening for a heartbeat. They are listening in the operating room, in the auditorium, in the lunchroom. They are listening miles away in the museum and in high school classrooms across North America. They are all listening for the same heartbeat. As the skilled hands of a cardiac surgeon bring the live videoconference of open heart surgery to a close, everyone is waiting for the familiar beepbeep- beep of the monitor that means the heart is beating on its own again. Since Advocate Christ Medical Center in Oak Lawn, IL, began videoconferencing live heart surgery from its ORs, countless physicians, nurses, students, and medical personnel of all kinds have watched these delicate procedures come to life. Initially, the hospital connected exclusively to the Museum of Science and Industry in Chicago, through its program Live... from the Heart. The OR signal would be sent via T1 line directly to the museum, where an invited audience would view the real time surgery, as would designated high school students across the country. With the opening in 2007 of a new conference center and adult surgical heart unit, Advocate Christ Medical Center has greatly increased its audience and its influence. 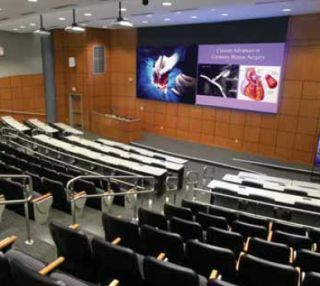 A sophisticated $450,000 video distribution system now links four operating rooms, a 245-seat auditorium, nine breakout meeting rooms, two open air lobbies, and a dining area. A Tandberg 6000 videoconferencing codec capable of 720i HD images ties the auditorium to the ORs, providing incredibly clear images of this sensitive surgery. "Nobody has anything like this," says hospital AV director Alan Drachenberg, "I have physicians coming in here and asking, 'What do you have?' and I say, 'What do you need?' This is unbelievable." Nestled in among the shiny chrome tools of Operating Room 16 are three Sony DXC390 video cameras with AMX pan tilt control, two on robotic arms, and a third fixed to the wall. One of the robotic cameras is positioned directly above the patient's chest area, the second above his legs to capture vein harvesting during surgery. The third camera provides wide shots plus closeups of the surgeon or his team. The hospital's AV staff operates the cameras robotically from a mini TV studio housed in the hallway outside the OR. A 20-inch Sony monitor and two JBL Control One wall-mounted loudspeakers bring questions from the viewing audience. Two Sony WRT 860A66M55 wireless mics are available to the team, but strategically placed Shure SM89 shotgun mics are less obtrusive and equally effective in making conversation between the OR and audience seem completely natural. While the importance of visual image clarity in these applications is obvious, clarity of audio is also vital in surgical videoconferencing. Media Resources of Lisle, IL, which designed and installed the conference center AV system, chose ClearOne XAP 800 and 400 audio management and distribution technology to erase the echoes that can cause audio chaos. "In an operating suite a doctor's hands are kind of busy," says Scott Woolley, director of product marketing, professional audio, for ClearOne. "Hands free conversation is needed. A headset would limit his mobility. Instead, a microphone is placed so the doctor or anyone else in the room can move about freely, but their audio can still be picked up and transmitted to distant sites." The challenge was to keep that OR mic from picking up the audio coming from the distant site and sending it back via the doctor's microphone along with his voice. "What our product does is prevent the audio that comes from a remote location from returning back to that location causing echo," says Woolley. That problem is eliminated by the XAP units' echo cancellation technology. Many videoconferencing systems don't accommodate enough microphones for AV systems as large as this one. "The nice thing about the XAP is that it is also a matrix switcher," says Brian Maksa of Media Resources. "You can run all your mics into the ClearOne and then run your outputs to the Tandberg codec or your recorder or Sony DVcam and so forth. Different devices sometimes receive signals at different levels, so you may have to lower the level going to the Tandberg, but raise it going to the recorder. The ClearOne is also an equalizer. With a general EQ, any adjustment would apply to all inputs, but with the ClearOne you can tune each individual input. And since it's PC driven, no one can change the settings without the software." The ClearOne XAP 800 has eight mic inputs; the XAP 400 has four more, and an AV integrator can add even more by linking multiple XAP units together. "Getting microphones close to the talker increases intelligibility. The larger the group, the more mics are needed," says Woolley. "Our systems automatically voice activate the mics. If only one person is speaking, our system senses that and only activates the mic closest to that person. If a second person talks it activates the second microphone, and so on." The echo cancellation circuitry distinguishes between audio sources in the local room and audio from the loudspeaker. Woolley says these features (and more) make the two-way conversation between the OR and the audience seem as if everyone was in the same room. The auditorium at Advocate Christ is home to most of the technology that powers the hospital's new conference center. During a presentation, three ceiling-mounted Sony VPL-FX51 6,000-lumen projectors allow for either a single image on the 24-foot-wide Da-Lite electronic wall screen, or two 9- by 12-foot images side by side, perhaps one of the surgery and the other of a PowerPoint presentation or something from the Wolfvision document camera. Two wall-mounted Sony EVID70 cameras convey images of either the front of the auditorium and a presenter or of the audience. Several wireless Shure SM58 handheld mics or Shure gooseneck microphones offer audio options during any session. An equipment rack in the control booth at the rear of the auditorium holds most of the support equipment, including the Tandberg codec and the ClearOne audio units. A console at the front of the room houses the DVD/VHS players, two PCs, a laptop connection, the document camera, a 15-inch AMX Modero touchpanel, and a 15-inch Hitachi T-15XL StarBoard Interactive display that shows the same images that appear on the wall screen behind the presenter. Since most of the presenters are physicians and nurses with varying degrees of AV expertise, the system at Advocate Christ needed to be easy to use. All touchpanels in the center look the same, but presenters are given individual passwords that grant them access based on their own level of training. "As you advance [in the training], there are more buttons available on the touchpanel," says Maksa. [See sidebar "Basic Training for Complex System."] "If you're a basic operator, you can't accidentally start a videoconference. You have access to a PC input, the DVD player, and maybe the volume. With a little more training, you get the ability to do project dual images. Third- level operators can access audio and videoconferencing." For added security, Media Resources linked one of the rear cameras to an Extron distribution amplifier that sends the camera feed to the AV department. The AV department can take control of the touchpanel from any networked computer if someone gets in trouble. Not all meetings involve live videoconferencing. For simple business meetings, the staff tends to choose the larger ground floor conference rooms rather than the auditorium. There's a simple reason for that: "There's no food allowed in the auditorium," says Drachenberg. "Physicians have no time to eat and then meet. They have to do both at the same time." The two larger first floor conference rooms, both divisible, have systems similar to that of the auditorium, with 12-inch AMX touchpanels controlling a single camera and Sony VPLPX41 projector. There, Tandberg's picture-inpicture feature takes the place of the dualimage technology. The smaller conference rooms have basic AV systems that include a PC connection, a projector, DVD player, and audioconferencing capabilities. Staff can plug in a portable Tandberg 3000 videoconferencing codec as needed. Extron Medialink push-button panels offer all the control these basic systems need for smaller meetings or overflow crowds from the auditorium. Cardiac operating rooms are an environment unto themselves. They are very cold. They are sterile. More often than not, a surgeon has music playing while he works. The various audiences watching the surgery at Advocate Christ Medical Center, whether they are doctors, staff, or students, are privy to all that goes on, asking questions, listening to answers, watching closely. What no one forgets, however, is that a patient is waiting too...for the beat of that same heart.